Last week we had a half gallon of cream that needed to be used up and Matt had been talking about making butter using the mason jar method. You remember right? It’s the method your 1st grade teacher used as she sat you all in a circle instructing you to take turns shaking the jar? Yeah, that one. Since I didn’t have the energy of 26 1st graders to make this happen, I needed the brute strength of one good husband to finish off the project. Thanks Matt! On a quiet afternoon I poured some of the cream into a glass jar and joined Matt on the porch for some relaxation. I began shaking my jar full of cream as I rocked on the porch. The twist to this story – I didn’t get to relax much, and we ended up with not-quite-yet-butter. (Trying a project first and then researching the correct method is usually my M.O.) But you never know until you try. Right?! 1. Add cream to a jar. Use a jar with a tight fitting lid. We used a quart mason jar and filled it only about half way so the contents could move when shaken. Hint: higher quality cream yields higher quality butter. You’ll want at least one more person to help out with this stage. No matter which method you use, cream will go through a few stages. First, it will turn into whipped cream, then into a grainy-looking curd-like substance with liquid. Don’t stop there. This is where we stopped, all excited, then ended up with the white curdled stuff that’s somewhere in between whipped cream and butter. You’ll want to continue shaking until you have a solid lump of butter that separates from the liquid in the jar. This may take about 30 minutes of vigorous shaking. If using an appliance to make it, the butter will take on a lightly golden color when finished. Notice the curdled-looking cream. We prematurely stopped shaking here. The liquid is pure buttermilk! 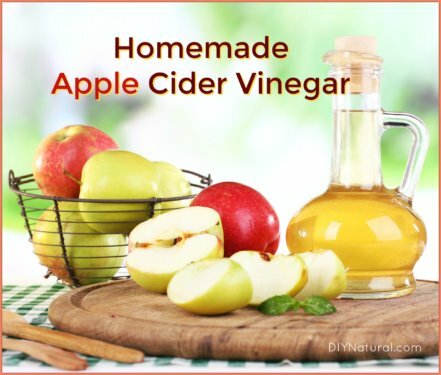 It can be strained into another jar and saved for pancakes, drinking, or other baking projects. Strain off as much liquid as possible. We used a fork to release the remaining liquid from the butter. It took us several minutes of “kneading” with a fork and straining repeatedly. You can also scoop out the butter, wrap it in cheesecloth or a clean tea towel, and squeeze to release the liquid. This is a step we found out about after we made our first batch. I read that rinsing under tepid water is best. Water that is too warm will turn your butter to a mushy mess, and water that’s too cold will cause the butter to harden and make it difficult to work with. For this step you can leave it in the jar, the cheesecloth/tea towel, or scoop it out onto a plate where the butter can be smooshed around with a spatula. Rinse until liquid runs clear from the butter, and squeeze/strain all liquid off. 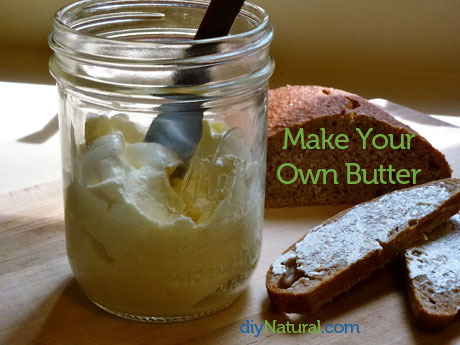 Pack butter into a container for storage. We have read that it will only last a few weeks in the refrigerator, so try freezing if you have too much. For freezing, a piece of waxed paper can be pressed on the top surface of the butter if storing in a container. You could also mold your butter into rectangles, balls, etc., and wrap in waxed paper for the freezer. If you have a butter bell you can add a little water to the bottom of the crock and keep fresh butter unrefrigerated for several days. Even though our impatience yielded not-quite-yet-butter, it still tastes delicious and looks beautiful. I enjoyed it on some zucchini bread this morning and we’ve spread it on toast and warm veggies. Next time we’ll use one of our wonderful kitchen appliances to speed the process and save me from developing a Popeye forearm. Processing the butter longer and rinsing it will also be part of our next experience. Have you ventured into butter-making at home? Tell us about your experience and share any lessons learned with the community. I made butter like this when I was a kid. I was in the hardware store and saw the paint shaker which gave me a idea. The next week I bought some cream,put it in the jar and rode my bike the two blocks to the hardware store and asked them to put it in the paint shaker. It took about two minutes to make the butter and the clerks had a ball doing it. I did that many times over the next few years and I think they had more fun then I did. Reading the comments about all the shaking required, I thought of the same thing! The new paint shakers at some stores are able to handle a 5 gallon bucket. Much quicker and a bunch of butter! This information was so informative, i paln to try this as soon as i find an inexpensive place to purchase the heavy whipping cream. We use a lot of butter in our home so I’m sure we will benefit greatly. Lots of good info in all the comments too, if you have time to read them. 🙂 Good luck on your search for good, inexpensive cream! I made butter this weekend with Heavy Whipping Cream. My kids love to do this and its a great way to spend time with them. We have made butter using the jar method and it was good, just long and tired arms. We mixed it in the miser this time and it was so much faster and easier and turned out even better! Now to make the butter milk! my husband and I like to make out own butter, we tried making it with heavy cream…we pour heavy cream in a glass bowl, then use the mixer to beat it…we either add sugar (for sweet butter) or salt…it tastes soooo much better than store bought. Add me to the list of those who need a little clarification on what type of cream to use. Is it heavy whipping cream (that you *could* buy in a grocery store), or is there somewhere else to find this type of “cream”. We have plenty of farmers markets around, so I imagine we have easy access to this, I would just like to make sure I get the right stuff when we go out. Where do you guys source yours from? We purchase our heavy cream from the farmer we buy our raw milk from. It would be a great idea to start some dialogue with farmers @ your local farmer’s markets and see who’s selling cream from pasture-fed cows who aren’t being given hormones/antibiotics. You could purchase organic heavy cream at the grocery store, but there are so many benefits to buying from a local farmer if you can. It doesn’t take much to do so, Ruth. We used old lumber (you can use pallets), some old rafters that were given to us, old boards & countertops for the roof (covered with a large tarp) and put square flax bales all around the walls for insulation and to actually create the walls. They are secured in place so that they don’t fall. You will want cats to keep the mice down, and some muscovy ducks are invaluable to clean up the extra grain, mice and some snakes (if you have them). Our floor is dirt and the ground is sloped so things run out. Straw is used to keep things clean and removed promptly whenever soiled. Smell is next to non-exsistent. The space for milking is minimal with enough room to tie the cow (we use a chain to attach to her chain necklace), and enough room to move in case of a kick. We have a large nail to hang the pail up and out of the way when empty and full. If you want to do it, you can find a way and it doesn’t have to break the bank. have fun! In our area, we have a local farm that sells shares of milk from their dairy cows. (legal in our state) You receive a gallon of milk per week. I haven’t actually taken advantage of it because we have 9 people drinking milk in our family and easily go through 4 gallons plus. I think about the benefits of hormone free milk, homemade butter, and all these great ideas previously posted, but I have a cost problem. ($28/mo for 4 gal) What are some of your thoughts…..should I or shouldn’t I? I am taking a leap here and hoping that you live in the country…is there any way you can *keep* a good Jersey cow (perfect for volume of milk and volume and richness of cream) or find out if you can “share” (or split the cost and care of) a cow with someone else who might live in the country privately? Depending where she is in her lactation, our Jersey gives up to 2 1/2 – 3 gallons of milk a milking (twice a day), with organic feeds (rolled barley for her milking treat), no medications, etc. I would urge you to look into that if you haven’t. That cow share sounds super, super expensive and really not worth your while when you might be able to do the same! If you are in the country, this can be very cost effective. Especially if you can do a cow share yourself and make a bit extra. We find that we go through more milk than most, and our kids are still very young. 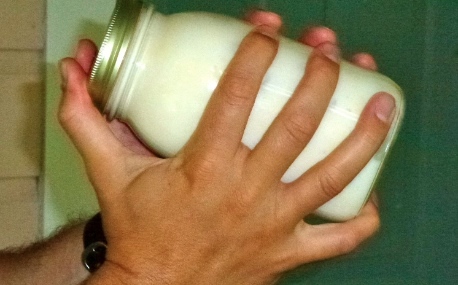 We consume about 1 1/2 gallons of milk a day, in drinking alone. We found that even when we were consuming way less than that in a day, that we were saving ourselves a couple of thousand dollars a year, even with the expenses of keeping a cow. At that time, we saved on milk, cream and butter. Now that I know how to make cheese and a few other things, we do use more than 1 1/2 gal. in a day, but we have the opportunity to save even more. It doesn’t have to take away from life, as many might say (tying you down), instead it can enrich it greatly. It is great for children to learn responsibility and more. It can be a family activity. If you keep your calf on (ours is still on at almost a year old), we have the flexibility of leaving her on and skipping a milking here and there. To boot, we will have lovely meat once it comes time for butchering, saving us even more. I used to make butter using this method when I taught preshcool. There is one difference though. We used baby food jars and added a marble to the jar to help with the mixing of the butter when the jar was shaken. It made beautiful smooth creamy butter that way. For myself, my preference has always been to use my blender. It makes really nice creamy butter that way. Yum! The flavored butters sound spectacular! We’ll have to experiment. Thanks for the post. 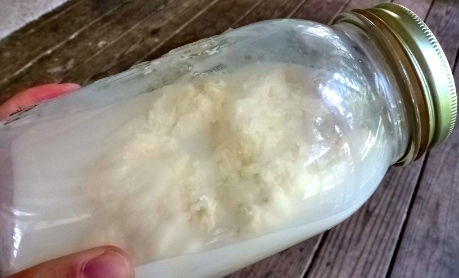 I have a video of the West Ladies “Dairy Delights” from the Homestead Blessing collection made by Franklin Springs that demonstrated this method along with other homemade dairy dishes. I went to my local salvage store & bought some small whipping cream cartons for .99 cents each & made homemade butter & honey-butter. It is delish! I made it while sitting on the couch watching TV & worked out my arms and shoulders. It has to sit out for a bit in order to be soft enough to spread, but it is better than all of that whipped up imitation butter. I am in the market for some fresh milk straight from a dairy farmer, but have not found any near me. Unfortunately, my local salvage store does not carry it regularly. The cream is nearly $6.00 for a quart at my local WalMart & I just refuse to pay that. I am looking to cut out the middle man. So we are using the store-bought for now. Have you done a search online? You may/may not know that raw dairy is unfortunately not legal to sell or give away in all states and provinces. I have no idea what might happen if you cultured the thin buttermilk (from butter making). The stuff in the store that most are familiar with is cultured milk (improperly called “buttermilk”), and it is milk based. I am not sure that the same culture that is in the bought buttermilk is available to the public, as I understand that it is a very specific culture. I know that you can buy cultures for making cheese from cheese making supply places. The two main live cultures that are usually sold are mesophilic and thermophilic, and there are many variations. Here is a place in Canada that sells them: http://glengarrycheesemaking.on.ca/ There are many other supply places in the US. 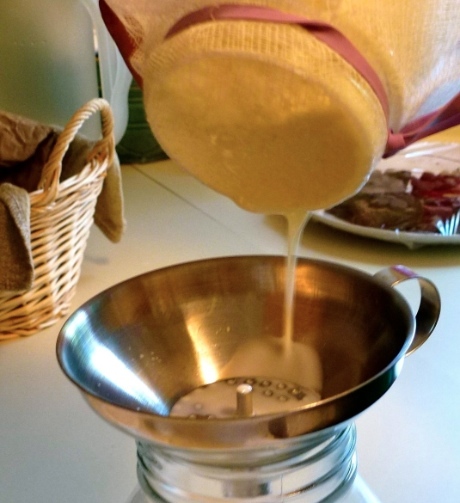 Here is how to make your own cultured buttermilk (I haven’t tried this myself). It sounds like you will either need to buy some in the store for making more or take a chance on catching the right culture out of the air to be successful: http://www.wikihow.com/Make-Cultured-Buttermilk I have no idea how long this buttermilk would be good for. I know that yeast can affect hard cheese making, so just to be on the safe side, wash off your counter surfaces and don’t be making yeast breads and the like while this is being made. Yeast floating around could possibly spoil your buttermilk. As with all cultures, they need to be refrigerated at a specific temperature in order to stay viable, and you will most likely have to start a fresh batch with fresh cultures after a while because the bacteria in your freshly made buttermilk will weaken over time. 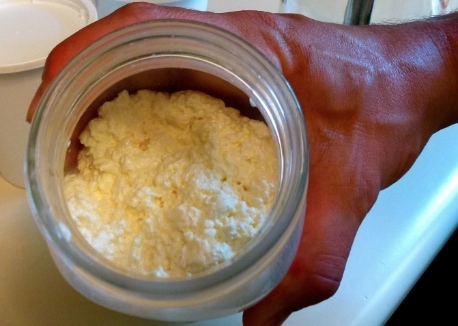 I did do some more online research and find that cultured buttermilk (for making sour cream) is the resulting whey when you inoculate the cream before making butter. Next time, I will use yogurt, which is one of the suggested sources of the required cultures. It just so happens that I have some yogurt incubating as we speak (ok, as we “write”). I’ll post again to let everyone know how this went. In the meantime, it’s buttermilk pancakes for breakfast, using the fresh buttermilk that I already have from the butter I made this afternoon. L – thank you SO much for all the info you provided! This is a great forum! Toni, that is interesting. I have used yogurt as a sour cream culture before (I think I mentioned that). It tasted really great! I never thought of going further and churning it. I am looking forward to the results of your experiment. OT: Now after reading it again, now I know what I did wrong with my last buttermilk that I froze and why it didn’t work when I wanted to use it as a starter. I put it in the trays and froze it without ripening it first. Nothing like not reading the directions! Do NOT use this type of buttermilk for making sour cream. The one that you need for making sour cream is cultured buttermilk, which is actually a specific culture mixed into milk. It is far different from the buttermilk resulting from making butter and will not turn out as intended. You can also use cultured buttermilk as the culture for some homemade cheeses, by the way. Toni is right in that using the cultured buttermilk mixed with cream makes the most heavenly sour cream though. 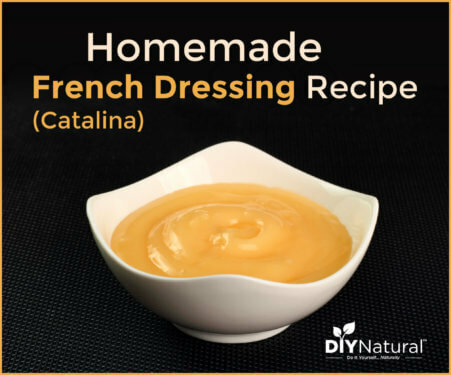 It is perfect on fresh fruit or in place of any other bought sour cream, and it is way healthier for you too. I also found that if you add a high fat yogurt (live culture) to cream (instead of milk, which would result in more yogurt), that you will come out with something closer to the bought sour cream, just without the additives. I will most definitely make my own butter now! Thank you so much for all the work you do experimenting, and then writing your wonderful posts. I want to add a suggestion to your list of things to do with your buttermilk. Make sour cream! It’s unbelievably simple and I’ve done it myself with delightful results. Put 2 cups of light cream and 2 Tablespoons of buttermilk in a pre-warmed glass jar with a screw lid; shake well to blend; then let stand in a warm place for 24-48 hours until thickened. Refrigerate as soon as it’s at the right consistency for you, and stir before using. It’s good for up to 3 weeks. I was thrilled to find this recipe but not so thrilled to have to buy a quart of buttermilk (the smallest container I could find). If I make butter first, I’ll have only a little buttermilk and that should be enough for sour cream. I’m so excited!! This is something we haven’t tried yet…thanks for sharing! I recently did this with my kids! It is (as stated before) much easier if the cream is room temperature. We only used a pint jar and a 1/2 pint of cream yielding much fewer results, but it only took about 5 minutes with the 3 of us shaking. My kids (9& 6) were amazed at the transformation from cream to whipped cream then finally to butter. Plus it was delicious on some fresh from the oven bread! Annyira jó ötlet. Köszönöm hogy megosztotta. I should have added, if you do go with the jar method and fill it 1/3 full, the process goes a lot faster as well. If you overfill or need to use a larger jar, it will take longer. We found this out by trial and error. Something else that came to mind…my grandpa said that where the old dasher style churn came in handy was if there was too much milk content in the cream. He said that this was the ONLY way to make something like that turn into butter. If you didn’t have or make a dasher, you were out of luck. lol One day we made one with a dowel and some untreated wood. We used a plastic 5 gallon food safe pail and lid. BAD idea using a plastic pail. We blew the bottom out and had a slippery mess. Needless to say, we didn’t get any butter that day. Not funny at that time, but I enjoy it now. If you ever have to do this, try it with a metal one, but don’t expect it to come out dent-free. We make butter all the time since we have our own jersey (rich, thick cream…and lots of it). I have been making butter for many years now. We started with a 3 gallon churn, but it is now retired. Then we went to a glass gallon jar, now we are doing smaller batches daily (as opposed to saving it up for a greater quantity) with smaller jars. We will be getting a 4 qt. churn soon and we are so excited! If you use the jar method, you are best letting it warm up only for a short while (no longer than 20 min. if you like sweet butter), and only fill your jar 1/3 full. You really need the space for your cream to expand and room for the agitation to happen. 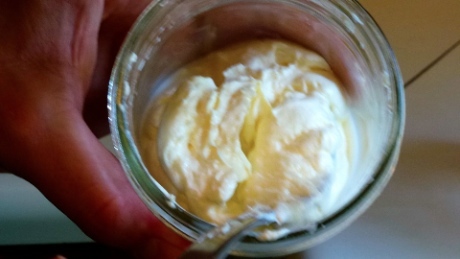 If you like soured/cultured butter, then you can leave it out longer. Like one poster said, she likes it that way. I will only eat the sweet butter. I strongly dislike the taste of butter where the cream has been left out a long time. We never rinse our butter, although my aunt does hers. Rinsing it might help keep it longer according to some sources, but unless there was a high milk content in the cream (you REALLY don’t want that), we found that we could work enough buttermilk (which is a type of whey) out of the butter that it was REALLY hard and lasted quite a while. It was only a greasy disaster if you don’t have really heavy cream. We also found that when we froze our butter, wrapping the butter in a 1 lb (2 c.) size was handy. We can fit 2 of these in a good-quality medium freezer bag. We use parchment paper instead of wax paper. The wax paper tended to go soggy, and the parchment paper will not become this way. We also mark the date we made the better on on the outside of the freezer bag. Oh, and the color and the sweetness of the butter depends on the quality of the cream, not on the method that you use to make it. If the cow has been eating grass and rich greens (alfalfa can help)…grass is always better for a really bright color…you will get a very almost bright fluorescent yellow. When the feed is of less quality (generally throughout the winter), the butter will become more pale. Karen…heavy (whipping cream) is the stuff you want. If you want really true to form butter, get some cream from a dairy if you can. If you read the ingredients of most whipping creams available today, you will find out that there is milk, carageenan (usually sourced from seaweed and used as an emulsifier), and other additives in it. It is not truly real cream and considering the content of the “cream” if would never whip without this. Milk does not whip. You will never get the bright yellow from the processed cream that comes from fresh farm cream in the summer. I have kneaded super thick cream by hand in a bowl as well. This came about when our cream came out of the cream separator not as cream but as almost butter. We found that a super tiny piece of the separator had gone missing, and this was the result…blue “milk,” and butter. It takes a very long time doing things this way, if you don’t have a separator gone bonkers to help you out, but if you want to try it for yourself you can start your cream another way, dump it into a bowl, knead, and feel the changes as it goes through each stage. It is an awful lot of work doing it this way, but the texture change is very interesting to feel. Have fun making butter. It is the only way to go. We have our own milk cow so we have plenty of cream. We have used many methods but usually just throw it in the blender. Its quick and easy. One tip that I read a long time ago, and we continue to implement, is to set the cream out and allow it to warm up to room temperature. It will make butter faster :)! Someone else mentioned allowing the cream to set out…guess we’ll have to add this to our routine! Have you read the Foxfire books that came out in the 70s? 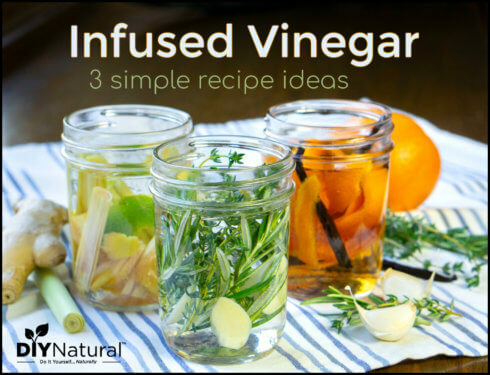 Great source for natural stuff. I have flipped through them before, but haven’t read them. We have been told they’re great! When you say “cream” do you mean half and half or heavy cream? Also, could you elaborate on the appliance method of making butter? Thanks! Great question…I’m referring to heavy cream here. When making butter in appliances, you just need to pour the cream in, wait for it to go through the stages described in Step #2, scoop it out onto a plate or into a tea towel, drain & rinse using one of the methods in Step #4, then add salt if desired. I seem to recall you can add marbles to the mason jar to make the process faster. I don’t know that the idea of marbles in a glass jar sounds smart, but I seem to remember that. My dad’s family had a farm and they would toss the jar to the next of the 4 boys to keep the process going when one wore out. We’ve made it in the kitchen aid. Beware, when that split second change from whipped cream to butter happens, you’ll spray the kitchen with buttermilk if you don’t have it covered! I’ve heard of kneeding it in a ziplock bag too, but that takes longer than shaking. It goes so much faster if you add a marble or something to it! That makes sense! Thanks for chiming in! The shaking process is much easier if you allow the cream to come to room temperature. For an even richer deeper flavor allow the cream to sit out for a few hours or overnight before making the butter. Don’t worry it won’t go bad or make you sick. You’ll be glad to know that when you use your food processor, it’ll only take a couple of minutes. My Vitamix does a fabulous job of it! Nothing beats the taste of fresh, creamery butter. (Please excuse my Kate and Leopold moment). 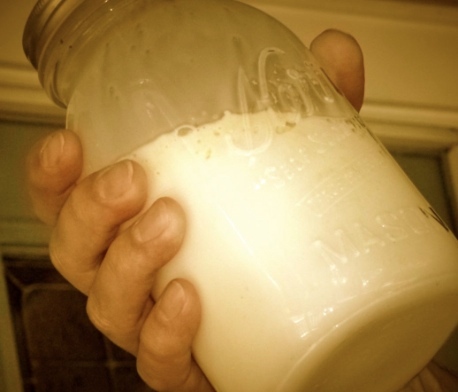 Centuries ago (I am 55) my grandmother had a few cows (they sold milk to a small dairy) would give me a mason jar with cream in it and tell me if I wanted butter on my toast the next morning I would have to make it. I did this regularly. My first experience was almost identical to yours! 🙂 I make butter if I happen to have extra cream, which doesn’t happen as often as I wish it would. I would definitely recommend rinsing with really cold water tho, otherwise its a soft, greasy disaster. You’re right Jo…I started thinking about this and realized the butter is probably much softer when using the shake method than when using an appliance. If using this method, cold water is probably the only way to do it…the place I read about using tepid water was from a woman using a Vita-Mix. Thanks for your thoughts! It is so much quicker using a stand mixer. The kids and I made it using my Kitchen Aid and it was quick easy and oh so tasty. How cool is that! Definitely going to try this! I may opt for the food processor method rather than the popeye! Thanks for sharing and thanks for the photos! I can’t wait! A ‘gazillion’ years ago when I taught Montessori at a preschool in Houston, we did this with the children. We put cream in a baby food jar and the kids danced around to music until there was butter! I’m certain that today they maybe would not allow children to hold glass containers and dance, but at the time it was great fun and we all learned from it…plus good exercise. Once the butter was made, we added a tad of salt and spread some on a cracker and everyone enjoyed!